Acquired: Signed as a free agent on Feb. 14, 2018. 2018: In 15 games (14 starts), Taylor finished with 46 total tackles, two special teams tackles and one quarterback sack. 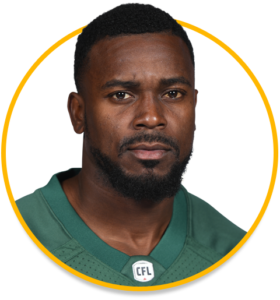 2016: (Ottawa) In nine games played, Taylor recorded 28 tackles, one interception, which was returned for a touchdown, and one forced fumble. Pro: Signed with the Minnesota Vikings after he posted a 4.27 and 4.33 40-yard dashes, but spent the 2012 season on the injured reserve. College: Taylor attended Florida International from 2007 – 2010 as a basketball player and appeared in 74 games.